NEW ORLEANS – With the final weekend of September finally upon us, cross country season is completely and unequivocally underway with large clusters of ranked teams from all divisions going head-to-head from sea to shining sea. 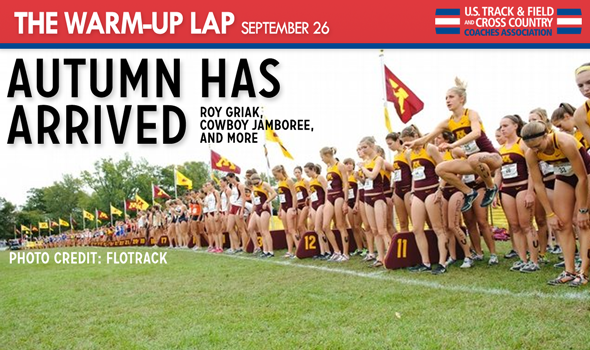 Minnesota’s Roy Griak Invitational — the first major meet circled on many cross country fans’ calendars — headlines an action-packed weekend with a meet featuring nearly as many teams as the state has lakes. From a defending champion vs. No. 1 battle in Boston and a No. 1 vs No. 2 vs. individual NCAA champion showdown in Stillwater to prominent top-10 Division II and III match-ups from Stanford to Williams and everywhere in between, the plotlines run as deep as the crowds lining the courses this weekend to take in the spectacle. If the match-ups weren’t enough, the stakes in Division I have been raised as of Friday with the beginning of the period during which teams can gain head-to-head wins that will go toward potential at-large consideration for the NCAA Championships. 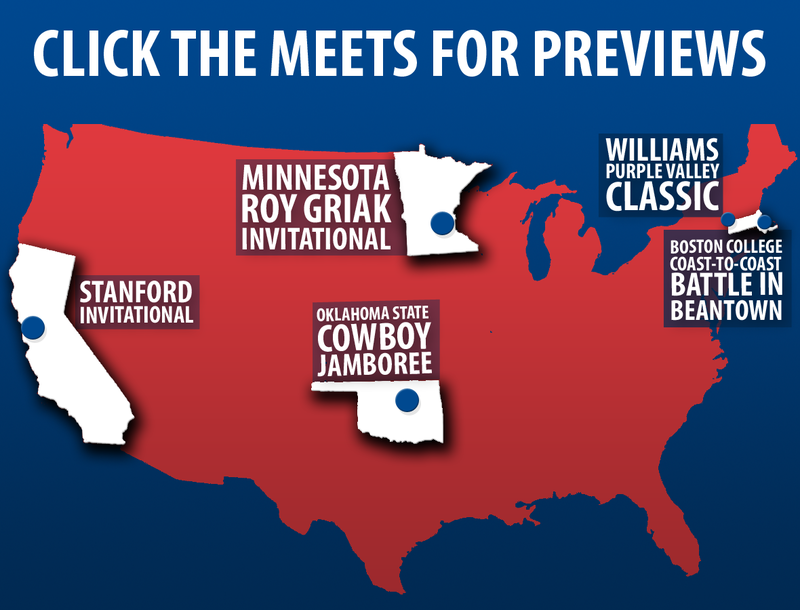 Instead of focusing on separate divisions, the Warm-Up Lap will instead take a broader look at a handful of important meets around the country. The map below includes links to the previews of five especially impactful meets that can be accessed simply by clicking the meet’s name. With a combined 30 ranked teams between all three NCAA Divisions in action, Minnesota’s Les Bolstad Golf Course is the place to be this weekend for the 28th Annual Roy Griak Invitational. Saturday will be a festival of races with six total collegiate races between the two genders — all of which feature multiple ranked teams from the three divisions — and a handful more high school races. The meet will be broadcast online by Flotrack in a partnership with Milesplit, and is available to Flotrack Pro Subscribers. The women’s Gold race, featuring primarily Division I squads and a handful of top-tier DII schools, is the biggest draw of the meet with eight of the top 30 teams in Division I and the top two from Division II. With all of its top runners except Amanda Russell suiting up, No. 5 Arizona will be going at nearly full strength against No. 12 Michigan State and a field of six other teams — including four 2012 NCAA Championships team qualifiers — hungry to move up into the top half of the rankings. Host Minnesota at No. 19, No. 20 Vanderbilt, No. 21 NC State, No. 23 San Francisco, No. 26 Iowa State and No. 29 Butler will all look to take advantage of the strong competition to boost themselves in both the regional rankings and national coaches polls. The team that emerges victorious among this pack — or even over Arizona or MSU — takes a very positive first step on the road to possible at-large NCAA Championships consideration with what would be an impressive haul of head-to-head victories. As if Division I wasn’t enough to worry about, the Wildcats will be pushed by defending Division II champion No. 1 Grand Valley State and perennial DII power No. 2 Adams State. The two programs have combined to win 17 of the past 21 Division II NCAA titles — GVSU has taken two of the past three while Adams State went on a historic run of 15 titles in 18 years. The Lakers return six of their seven runners and all five scorers from their 2012 title team, including three young All-Americans in sophomore Jessica Janecke and juniors Allyson Winchester and Hannah Osborn, while junior Madie Rodts just missed All-America distinction. Adams State likewise returns six of seven, but the runner it lost is a significant one as 2012 individual champion Alicia Nelson has concluded her eligibility as a Grizzly. Three other All-Americans are back in seniors Kelly Lamb and Alyssa Selve and junior Lauren Martin. The men’s Gold race won’t feature as many ranked teams as the women’s competition, but still enough-to make it a must-follow. No. 4 BYU is the top-ranked Division I team in the race — and at the entire meet — led by 2012 All-American Tylor Thatcher and three other returning scorers from the 2012 sixth-place squad. The Cougars — well-rested after taking down No. 7 Portland two weekends ago — will line up against, among others, No. 24 NC State and No. 29 Arizona State. But the biggest challenge for the Cougars likely won’t come from a Division I program at all. Also slated to compete in the Gold race is the unanimous Division II No. 1 Adams State, winner of four of the past five Division II Championships. Returning for the Grizzlies are five of their seven All-Americans — and only four of those returners managed to score points in the title effort. Juniors Kevin Batt, Tabor Stevens and Matthew Daniels took second through fourth, respectively, as individuals in 2012, and junior John Luterbach rounds out the returning scorers after a 15th-place finish. Senior Jovanny Godinez was the seventh runner, but still an All-American at 28th. The Grizzlies are also fresh for the match-up with most of their top runners having not competed in three weeks. Joining Adams State from the Division II ranks is No. 3 Grand Valley State. Senior Josh Moskalewski is the top returning scorer of three from the seventh-place NCAA Championships team. The Lakers already have experience knocking off Division I programs, as they were the unofficial team winners at the Michigan State Spartan Invitational two weeks ago in a win over then-No. 30 MSU. Division II and Division III will, for the most part, be split up into two corresponding Maroon races — four total with men and women. In the Maroon II women’s race, the lone DII champion other than GVSU or Adams State from the past two decades will be represented in No. 3 Augustana (S.D.). Former National Athlete of the Week and returning All-American senior Runa Falch and fellow All-American senior Kristin Brondbo are the lone returning scorers for the Vikings. In addition to an individual match-up of 2013 National Athletes of the Week in Falch and U-Mary senior Jennifer Agnew, Augustana will be up against ranked teams in No. 15 Minnesota Duluth, No. 20 Southwest Baptist and No. 22 Pittsburg State of Division II; No. 13 UW-La Crosse of Division III; and No. 7 Dordt and No. 8 Olivet Nazarene of the NAIA. The Maroon II men’s race is headlined by No. 5 Augustana (S.D. ), which returns two All-Americans in Travis Beniak and Adam Braun among all seven of its returning NCAA Championships runners. Toeing the line with the Vikings will be No. 16 Central Missouri and No. 20 Southwest Baptist of Division II; No. 2 UW-La Crosse of Division III; and No. 6 Olivet Nazarene, No. 14 Concordia (Neb.) and No. 16 Dickinson State of the NAIA. The Maroon III women’s race features No. 2 Wartburg and No. 24 Bates, while the Maroon III men’s contest features No. 7 UW-Eau Claire, No. 11 Bates, No. 16 UW-Oshkosh and No. 20 UW-Platteville — all of Division III. Stillwater, Okla., will be the site of the best men’s match-up in Division I this weekend as No. 1 Oklahoma State — defending national champion and winner of three of the past four NCAA crowns — takes on the team the coaches believe is the Cowboys’ top challenger: No. 2 Northern Arizona. Add to the mix the defending individual champion in Texas Tech’s Kennedy Kithuka to pull the pace along and cross country fans are in for a treat. Neither squad has run its full "A" team as of yet, though now would be as good a time as any to trot out all of their low-sticks for the first time — and indications are both the Cowboys and Lumberjacks will do just that. For OSU, Saturday will be an opportunity to make a decisive statement that the Cowboys will not relinquish their crown easily; for NAU, an opportunity for a big early-season win and a potential psychological advantage over the reigning Cowboys come November. The Cowboys possess 11 of the 12 first-place votes in the most recent National Coaches Poll behind four returning scorers from last season, including three All-Americans in seniors Tom Farrell, Shadrack Kipchirchir and Joseph Manilafasha. With all seven runners from its fourth-place team from the 2012 NCAA Championships back in action in 2013, the Lumberjacks are the keepers of the final first-place vote. All-Americans senior Brian Shrader and sophomore Futsum Zienasellassie are the top returners, with runners two through five placing in the top 80 at NCAAs a year ago as either freshmen or sophomores. From an individual perspective, Kithuka has yet to be challenged this year, but will see his strongest competition yet with as many as six other All-America finishers from 2012 NCAAs in the field: OK State’s Farrell (ninth), Kipchirchir (18th) and Manilafasha (24th); Northern Arizona’s Shrader (15th) and Zienasellassie (31st) and Tulsa’s indoor mile collegiate record-holder Chris O’Hare (20th). While No. 1 vs. No. 2 is the headline of the meet, it would be unwise to overlook No. 6 Tulsa or No. 28 Michigan, both of which were National Championships qualifiers a year ago. The women’s race doesn’t feature the same top-end match-ups as the men’s competition, but host No. 22 Oklahoma State will get a serious test from No. 17 Michigan as both teams battle for the valuable head-to-head win for potential at-large consideration. Individually, watch for 2012 NCAA sixth-placer Cally Macumber of Kentucky, who has already earned National Athlete of the Week status in 2013. While Minnesota may have the advantage in sheer numbers of ranked teams, Boston takes the (crab)cake when it comes to having the best women’s match-up of the weekend in Division I. The women’s race could be the most important in the nation this weekend with significant top-three ramifications as unanimous No. 1 and 2012 national runner-up Providence squares off against defending champion No. 3 Oregon. The Friars appear to be running their full squad, while the Ducks will compete in earnest without All-American Connecticut transfer Lindsay Crevoiserat and fellow UConn transfer Julia Zrinyi. The showdown is truly a tale of two teams. The Friars, on one hand, return three All-Americans from a year ago in Sarah Collins, Emily Sisson and Laura Nagel. Oregon, on the other, is rebuilding after graduating its top three All-Americans from 2012. Oregon may find the scenario somewhat familiar. After all, it was the 2012 Ducks who defeated then-defending champion Georgetown at Pre-Nationals — though both finished behind winner Florida State, now No. 2 — before going on to take the national title from the Hoyas in November. This weekend could be the first step in Providence turning those tables back on the Ducks. No. 9 Cornell will also have an opportunity to make a statement against a pair of top-three programs, as will No. 24 Boston College and defending Division III champion Johns Hopkins, led by former National Athlete of the Week Hannah Oneda. Speaking of 2011 national champions, No. 8 Wisconsin is the headliner of the men’s meet, where the Badgers will face No. 9 Syracuse, No. 12 Oregon and No. 25 Providence. Like the Oregon women, Wisconsin lost its top three All-American finishers from its runner-up team a year ago — all of whom were in the top-12 — but it was boosted by a sixth year of eligibility for No. 4 runner Rob Finnerty. The Ducks’ men’s squad will also compete without some of its top runners in 2013 NCAA 1500 meters champion Mac Fleet and Northeastern transfer Eric Jenkins, who had a breakout 2013 track campaign prior to his arrival in Eugene. However, senior Parker Stinson and junior Jeremy Elkaim headline a group that still more than capable of badgering Wisconsin throughout the race. Syracuse is climbing the national scene with six returners from its NCAA Championships team from a year ago, led by senior Joe Whelan (55th in 2012). Division I isn’t alone in featuring fantastic showdowns this weekend. Not by a long shot. In fact, the Stanford Invitational alone will host not one but two Division II top-ten tussles Saturday in Palo Alto, Calif. When preseason rankings were released in late August, the Chico State women sat comfortably atop the West region as preseason favorites and at No. 5 in the National Coaches Poll. Their stay at the top of the West didn’t last long, as by the time the first regular-season West Region rankings were released the Wildcats had slipped to No. 3 in the region and No. 7 nationally. Saturday will provide an opportunity for a head-to-head match-up — and a hint of redemption — with one of the teams who jumped ahead of them in the rankings: Simon Fraser, ranked second in the region and No. 6 nationally. Simon Fraser, on the other hand, finds itself in unfamiliar territory. In just its third year at the Division II level, the Clan is sixth in the nation. To provide some context, SFU was sixth in the West Region alone a year ago. But impressive team performances, including a second-place showing over a number of Division I programs at the Erik Anderson Invitational this past weekend, and strong running from Lindsey Butterworth have the Clan in position to do some damage on the national stage. Keep an eye out for No. 5 Claremont-Mudd-Scripps of Division III to make some noise in the race, as well. Chico State’s No. 4 men also have a challenge against a No. 6 squad on tap in the form of the Colorado Mines men — though the Colorado Mines squad has all the experience of a No. 2 squad as NCAA runners-up a year ago. With four of its five scorers from its fifth-place team back for more this year, the Chico State men are one of the most experienced teams in the nation, led by All-American senior Isaac Chavez. But with its No. 2 through No. 4 scorers returning from its runner-up team at NCAAs last year returning for another shot at the title, Colorado Mines is a team that knows how to run faster than No. 6 in the nation. Expect Orediggers and its quartet of All-Americans in Phil Schneider, Derek Alcorn, Andrew Epperson and Frank Socha to push Chico State to the limit, or perhaps beyond. The notable match-up for Division I is a women’s battle between No. 8 Stanford and No. 23 San Francisco. While coastal Massachusetts will be preoccupied with the Division I action taking place in Boston, fans of Division III should take a look at the western half of the state for a pair of top-10 showdowns at Williams’ Purple Valley Classic. The MIT men made huge waves in the National Coaches Poll earlier this week with a 23-position improvement to No. 5 in the nation and No. 1 in the New England Region after taking down three teams then ranked in the nation’s top 11 at Southern Maine last week. Senior Mike Wedge finished third at USM to lead four Engineers in the top 10 against the stacked field that served as a mini-preview of the New England Region meet in November. This week the target is on their back for the first time as they headline the meet at Williams. The biggest challenge will come from the No. 9 host Ephs and No. 23 Middlebury. MIT’s women are likewise the top-ranked team in their race, but they have to deal with a pair of top-10 teams in No. 4 Williams and No. 8 Middlebury, along with No. 28 Amherst. The Engineers emerged victorious in a close two-point decision over No. 18 Tufts behind runner-up junior Kaitlin Allen, and will be pushed even harder this weekend, should the teams choose to run a majority of their top runners a second week in a row. Williams is the most well rested team of the bunch as the only program of those mentioned to have taken last weekend off.